The corporate media claim that Detroit is being revitalized. 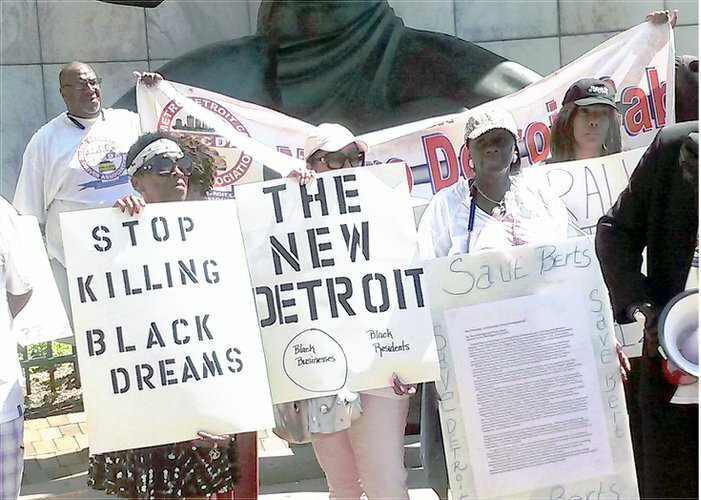 A rally and march at Hart Plaza on the Detroit River and at the Coleman A. Young Municipal Center (City Hall) on July 21 exposed this false narrative. The city emerged from a contrived finan­cial emergency and forced bankruptcy late in 2014. Billions were stolen from pensioners and residents, who witnessed private interests seize public assets under the guise of cost cutting. Over 60,000 households still face property tax foreclosures, while billionaires like banker Dan Gilbert and stadium owner Mike Illitch receive hun­dreds of millions of dollars in subsidies. Despite the media propaganda, the majority African-American population has had no economic revival since the Great Recession began in late 2007. Banks have made over 100,000 foreclosures in this city, while politicians did nothing to protect the interests of their working-class constituents. African-American shop owners are being driven out of the downtown and midtown areas. Taxi drivers must compete with Uber Technologies, Inc., a transportation service which has generated controversy and protest internationally by super-exploiting its worker-drivers. On July 21, both shop and restaurant owners rallied, beginning with a caravan from Eastern Market to Hart Plaza. Banks threaten to close Bert’s Market Place, a jazz club and restaurant whose African-American owner, Bert Dearing, lost it to foreclosure after a lengthy illness. The property was listed on auction.com with a starting price of $700,000, and Dearing says he has until 2017 to resolve the issue or move. Bert’s Market Place has been a center for people throughout the city. In 2011, Dearing opened his doors for a fundraiser in support of people’s attorney Vanessa Fluker after she had been fined by a local Wayne County judge. Fluker was known for her militant efforts to save a family’s home by appealing an unjust, implicitly racist decision. Other small-business owners at the demonstration discussed familiar scenarios. Owners of the buildings where they rent have sold to new interests that want the African Americans and their customers out. Beside shop owners and their supporters, Metro Detroit Cab Drivers Association members were also protesting. They say the growing influence of Uber services puts the local drivers at a disadvantage. Expenses for inspections, insurance and bond-plates fees, along with random stops by the police — who often ticket drivers for spurious violations such as not having an updated log of trips — leave them at a loss. During the rally a statement of solidarity was delivered by Cecily McClellan, a leader in the Detroit Active and Retirees Association (DAREA). This organization was formed after Judge Steven Rhodes, who presided over the federal bankruptcy, imposed pension and healthcare cuts. DAREA’s leaders were the most vocal opponents of the bankruptcy during the 2013-14 proceedings. At present they have filed an appeal in federal court to overturn the attacks against municipal retirees. After the demonstrators marched from Hart Plaza to City Hall for another rally, dozens of taxi vehicles began to circle the building, the drivers honking their horns in an act of defiance. Later, rally participants marched around the building, chanting slogans against current city policies under the corporate-imposed administration of Mike Duggan, the first white mayor in 40 years. At that demonstration, members of the Moratorium NOW! Coalition to Stop Foreclosures, Evictions and Utility Shutoffs addressed and encouraged participants to endorse the upcoming People’s Assembly and Speak-Out scheduled for Grand Circus Park downtown on Aug. 29. The Moratorium NOW! Coalition reminded the crowd that African Americans still constitute the overwhelming majority of the population of Detroit and that the people of Ferguson, Mo., and Baltimore have spoken to the concrete conditions prevailing in urban areas, pointing the way forward. If the city administration is ignoring African Americans, then we must fill the streets with angry people committed to reversing the downtown area’s business-as-usual atmosphere, the activists concluded. Poverty and jobless rates among the people who live in the city hover near 50 percent. 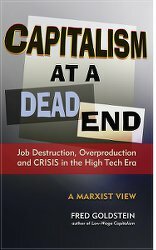 There are no plans for the implementation of a jobs program locally or nationally, which means that hundreds of thousands will remain on the margins of the working class. A list of grievances and demands on this leaflet calls for stopping police killings and brutality and jailing killer cops. Other issues include a $15-an-hour minimum wage, health care for all and single-payer now, halting tax and mortgage foreclosures, along with a demand to release federal Hardest Hit Homeowners funds to keep people in their residences in Detroit and Wayne County. This demonstration will emphasize the need for a moratorium on water shutoffs and to stop the ongoing attempts to privatize the Detroit Water & Sewage Department, which is undergoing a regionalization process as the Great Lakes Regional Water Authority. The Moratorium NOW! Coalition, along with DAREA, is supporting a petition drive to force a vote to stop regionalization of water services. Also on July 21, the same day as the demonstrations, the Detroit City Council, in a 5-4 vote, approved a 7.5 percent water rate increase. The state-run Detroit Financial Oversight Committee, which really runs the city in the post-bankruptcy and emergency management period, was behind this increase. These policies will force more people into poverty and threaten to terminate their water services. The Moratorium NOW! Coalition asks other local, national and international organizations to endorse the Aug. 29 actions. To support the initiative, contact Moratorium NOW! at moratorium-mi.org or call 313-680-5508. Photo: Protesters outside Detroit’s city hall, July 21.